2006’s Krrish is the second film in the Krrish franchise (which includes at least five films, a television show, television movies, a comic, and a computer game, and probably more tie-ins I’ve missed). It was written, directed, and produced by Rakesh Roshan. It stars the producer’s son Hrithik Roshan1 as the title character, as well as Priyanka Chopra, Rekha, and Naseeruddin Shah. As soon as orphan Krishna Mehra’s super-intelligence begins to show itself, his doting grandmother Sonia (Rekha) whisks him away to a remote village in northern India. Krishna’s father Rohit had similar abilities, which led to tragedy when an evil man tried to exploit him. Sonia is determined not to lose her grandson as she lost her son and daughter-in-law. Sonia can flee the world but that won’t keep the world from coming to that remote village. Krishna grows into a good-looking young man who spends his time communing with nature and casually demonstrating his superhuman prowess. The villagers have come to accept his curious ability to outrun horses and his extraordinary strength. Still, Krishna feels socially isolated2, and he yearns for something more than being the most colourful figure in a backwater town. Enter Priya (Priyanka Chopra), whom Krishna saves from a near-fatal paragliding accident. Immediately smitten with her, Krishna resorts to lies and trickery to win her over, all the while trying to conceal who and what he is. A ploy he abandons when it seems it will hurt friend Badahur, a guide working for Priya’s tour group. Priya’s stay in the north lasts long enough for Krishna to become thoroughly besotted with her. It also lasts long enough for her to get a pretty good idea of Krishna’s abilities — and for Priya’s editor to threaten to fire her for overstaying her holiday. Priya wins a stay of execution by promising the editor a great story about an Indian superman. Years ago, supposed businessman-philanthropist Dr. Siddhant Arya (Naseeruddin Shah) hired Krishna’s father Rohit (also played by Hrithik Roshan) to design and build a super-computer so powerful it could predict the future. Arya promised to use this computer to help the world. He actually planned to use the computer to rule the world. He intended to kill Rohit as soon as the computer was functional, as Rohit would be ideally placed to frustrate his plans. But when Rohit booted the computer, it revealed the evil Arya’s plot. Rohit smashed the computer. He disappeared, presumed dead. Sonia suspects that Arya would kill Krishna if he knew of his existence; the son might try to take revenge for his father. That is why she hid away in a small village. She warns Krishna that if he travels, he must not under any circumstances reveal his descent or his abilities. Arya might learn of his existence and kill him! Krishna promises Sonia he will be careful and heads off to Singapore. Priya tempts Krishna to display his abilities but he remembers his promise to Sonia and refrains. Until … he’s forced to choose between his humanitarian instincts and his promise when a fire breaks out at circus, trapping a number of children in a burning tent. Inspiration strikes when he sees a broken clown’s mask. By reversing his coat and donning the mask, he becomes a person entirely unlike Krishna, provided that person entirely unlike Krishna was also played by Hrithik Roshan. Krishna nearly gives the game away when a child he is rescuing asks his name. He manages to catch himself in mid-name, calling himself Krrish and not Krishna (Singaporean children can apparently hear spelling). Priya gets a close look at Krrish and wonder of wonders, is convinced that Krishna and Krrish are one and the same. She sets out to expose him. After all, her job is on the line! As it happens, Dr. Arya is based in Singapore. Publicity re Krrish’s exploits alerts him to the existence of Rohit’s son. Krishna must be killed. Which is possible as, unlike many superheroes, he is not bullet-resistant. Of course, Krishna might welcome a bullet once he realizes that his beloved Priya only invited him to Singapore in order to exploit him. This is a Bollywood film so it’s not surprising that it is studded with lavish production numbers. If you find it odd that the cast spontaneously breaks out into expertly choreographed song and dance numbers, you might be a Westerner who has never watched any Hollywood musicals. Hollywood stopped doing musicals (mostly); Bollywood (and the other Indian film industries) have kept right on. Western viewers may also be confused by the masala plot. Masala is a spice mix; masala plots have everything. They mix action, romance, over-the-top melodrama, song-and-dance, and anything else that might attract an audience. 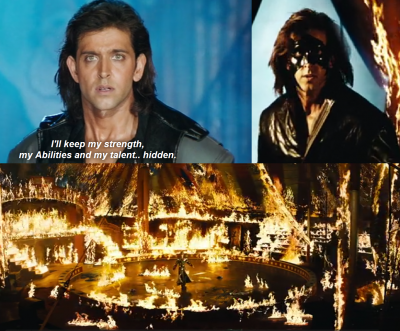 Krrish is pure masala. It’s also long, as is common for Indian movies. They tend to be three-hour extravaganzas, with intermissions. South Asian audiences want films that give them their money’s worth. But length can slow the action. Krishna doesn’t arrive in Singapore until an hour into the film. He doesn’t don his mask and become Krrish until another forty minutes have passed. More than half the film is non-Krrish. This sort of thing doesn’t faze South Asian audiences, who made this film a hit. There are number of moments in the film where Krishna’s efforts to be a superhero are notably inefficient. In his defense, he didn’t set out to be a superhero. There’s no reason to think he’s ever spent much time reading about, or watching films about, two-fisted costumed adventurers. He’s making it all up as he goes along. The burning circus scene features some awful parents. Not only do they stand around asking passers-by to race into a flaming circus to save their kids, but they presumably abandoned all of those kids to the fire in the first place. Obviously, having terrible parents is not the children’s fault, but I must wonder if handing the kids back to people who left them to burn is the right decision. Krishna is luckier: his parents may be absent but Sonia does her best to protect him. Arya makes two classic mistakes with his super-computer. The first is he’s the bad guy in a narrative universe that doesn’t favour villains. At the very least, he should have tried to be a well-meaning extremist, not a would-be god. The second is his conviction that knowing the future will allow him to alter it, as opposed to ensuring that the events he wishes to prevent will occur thanks to his efforts to avoid them. It’s a point on which mythological figures from Laius to Astyages to Kamsa could school Arya. If they weren’t too dead from having demonstrated this point. Sonia’s determination to keep Krishna from endangering himself by drawing attention to his abilities reminded of one version of the Superman myth: Zack Snyder’s terrible Man of Steel. (This came out after Krrish, but there’s no reason to believe that Snyder was in any way influenced by the Bollywood movie.) Of course, there are differences: Krrish wasn’t filmed in glum blues and greys. Man of Steel and western superhero films in general lack production numbers. Man of Steel’s Superman is a put-upon grump, whereas Krishna is good-natured, eager to help, and smiles while doing good. Remember when the good guys smiled? Krrish is available on Netflix. If it is available on either Amazon or from Chapters, I could not find it. 1: Hrithik’s first starring film role, in Kaho Na … Pyaar Hai, was also in a film produced and directed by his dad. It was a mega-hit. Hrithik may have owed his entrée to nepotism, but he earned his place. He has appeared in many more hit movies and is regarded as one of the industry’s top artists. Contributed by my editor, who is major Hrithik fan. 2: Krishna has lots of friends. Problem is, most of them are the village kids (who are often exasperated by his inability to rein in his powers). The exception is guide/comic relief Bahadur (Hemant Pandey), who is an adult. Everyone seems willing (if not necessarily eager) to support Krishna’s gambits to keep Priya and her friends off-balance. But Bahadur and the kids are not attractive women played by Priyanka Chopra. I suspect that the paucity of love interests is what is on Krishna’s mind when he complains to Sonia about his isolated life.